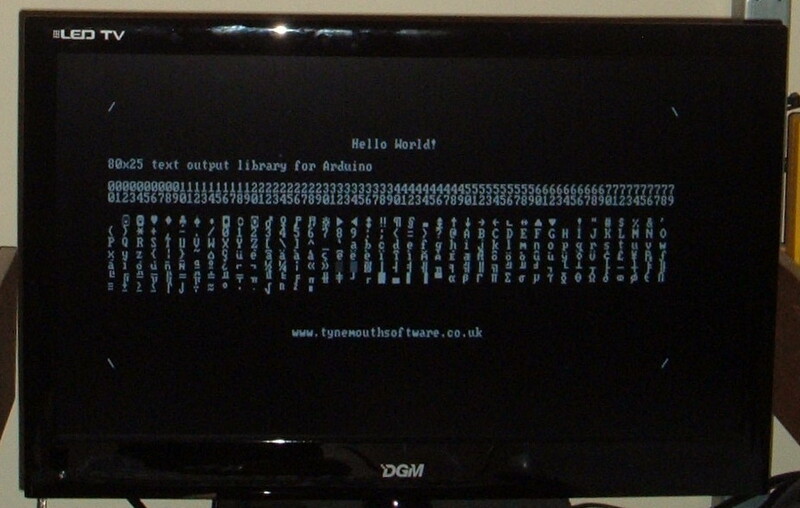 Arduino TV Out has been around for a while, but you can't get many characters on the screen and uses a lot of the Arduino's resource. 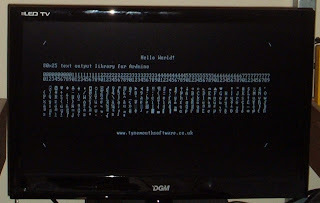 This is a library which will let you generate an 80x25 text screen on a TV or monitor from an Ardiuno. 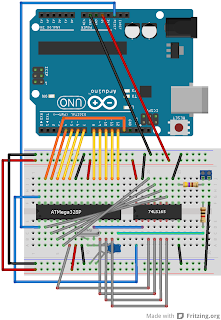 Well I say from an Arduino, it's more like two Arduinos, or to be precise, an Arduino and a second ATMega328P as a video processor, and one additional TTL chip. 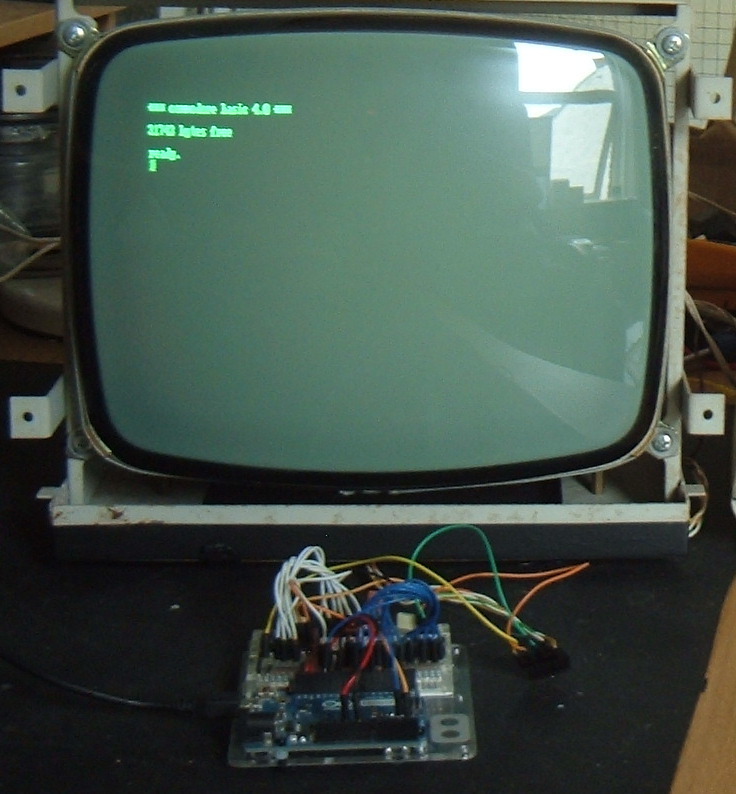 The video processing work is all done by the second ATMega328P, the video processor. 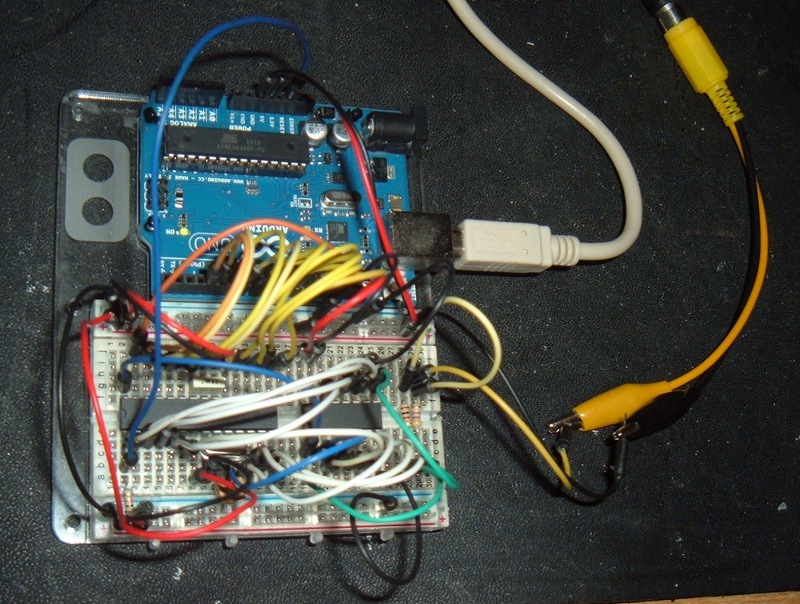 This leaves the main processor (the ATMega328P on the Arduino) to do whatever you like. There is a simple 8 bit data transfer whenever a new character is to be added to the display, in a similar way to driving an LCD display. The concept comes from Grant Searles Monitor and Keyboard interface, itself an update of code by Daryl Rictor (40x25 display using an ATmega8). 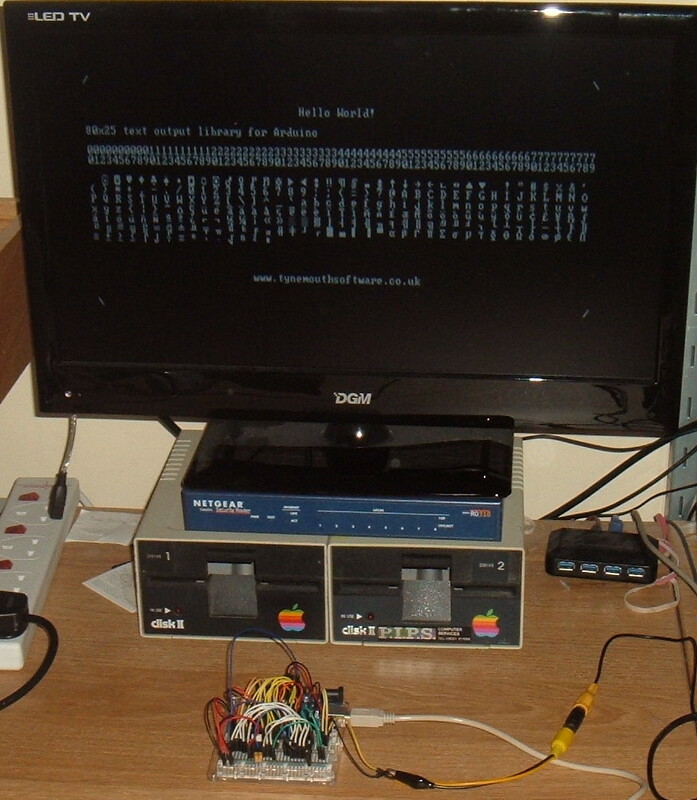 The code in the second chip is unmodified from Grant's (download from his page above). 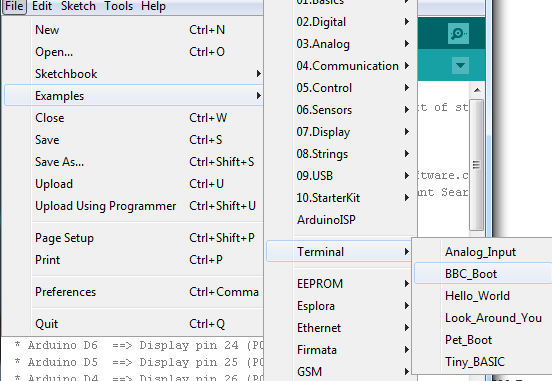 I've completely rewritten the Arduino code, now in the form of a library to make it easier to use. The idea is basically this, the Arduino (the first ATMega328P) has an 8 bit output port and two control lines. 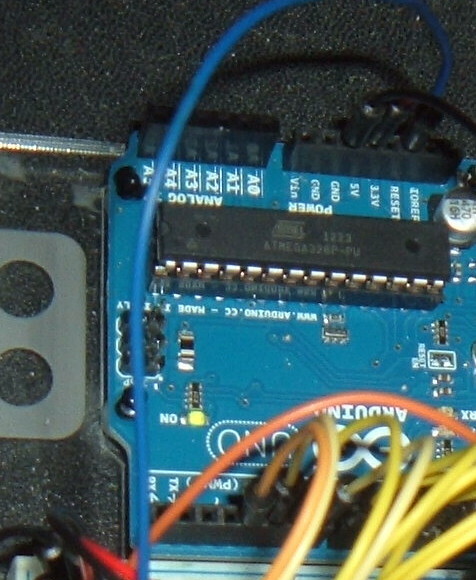 This interfaces to the video processor (the second ATMega328P). This has an 8 bit output port and 1 control line which is fed to a 74LS165 or 74HCT166 shift register (the pinouts are different, but they can both provide the necessary functionality, you may have more luck finding the 165) [Update: the 166 is preferable, and the HCT version should be used if possible]. 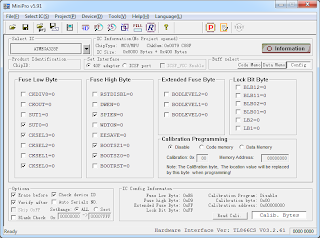 The output of the shift register is the character video output data. There is also a composite sync is output from video processor. 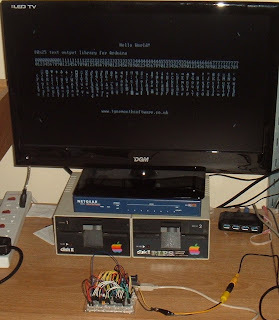 The composite sync and video data are combined via two resistors and this forms the composite video output. This composite video output is suitable to drive a modern LCD TV or an old CRT TV or monitor. OK, so how do you do it? Well first you need to program the second microcontroller. 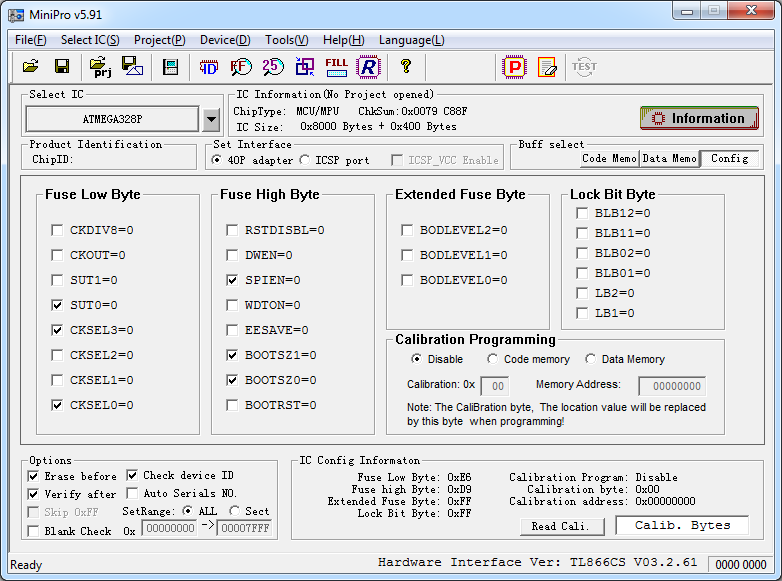 This is written in assembler and does not use the Arduino bootloader, so needs to be uploaded via a programmer. There are many options, use an external programmer, use something like the USBTiny ISP to program in circuit, or use the Ardunio as an ISP. 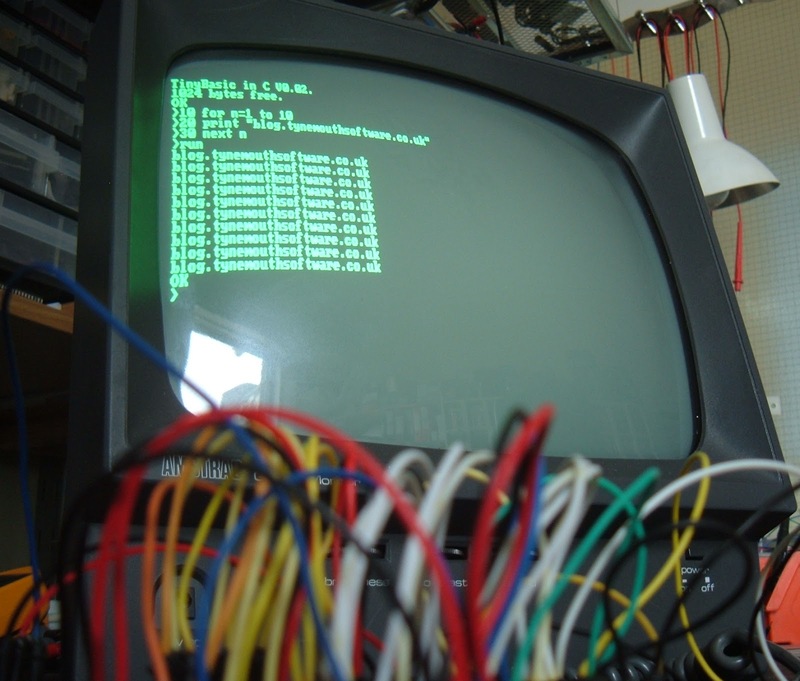 If using an external programmer, such as the MiniPro, select ATMega328P, set the fuses to E6 D9 FF and select Grant's SBCVideo.hex file. 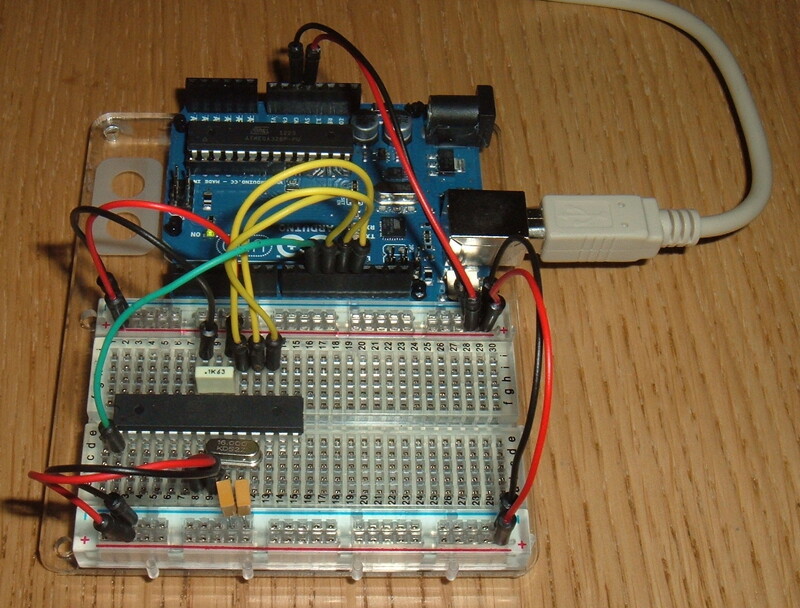 Alternatively, since there is already going to be an Arduino and a second ATMega328P, Arduino as ISP can be used. 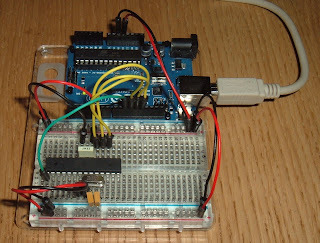 Wire up the circuit as per the Arduino as ISP demo (leave some space for the 74LS165). 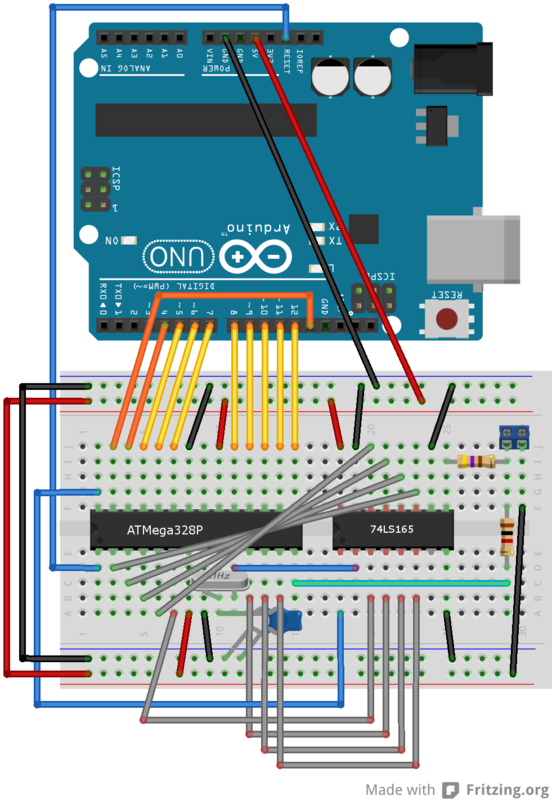 Here is an excellent tutorial on Arduino as ISP, and more info on avrdude. It should probably look neater than this. Once that is built, you can get on with the coding. Download the Terminal library, unzip it and copy the 'terminal' folder into the library folder in your Arduino workspace. You should then be able to include the terminal.h file in your projects. 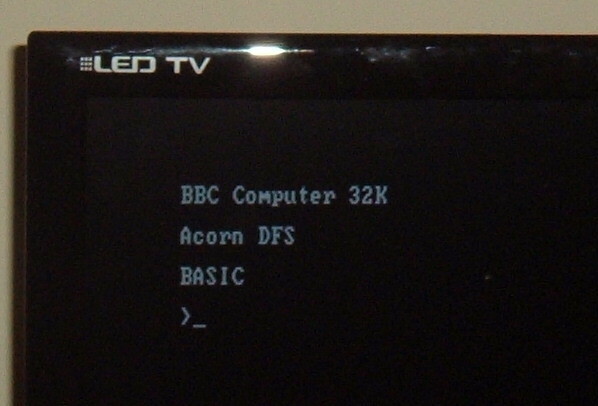 There are a number of examples provided, these show using the library to generate things like a BBC Micro startup screen. Since the work is now being done by the video processor, it leaves most of the Arduino free to do something more useful. 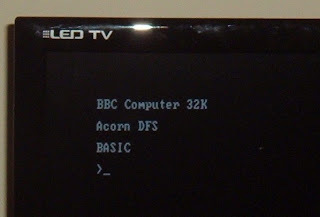 For example, with a slight modification to Mike Field's Tiny BASIC, it can use the terminal as an output. 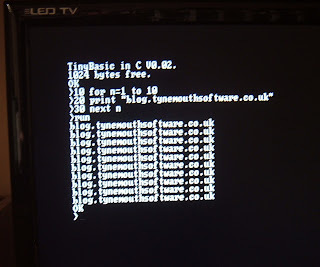 The input is from the serial terminal. It is left as an exercise for the reader to provide a keyboard of some sort. 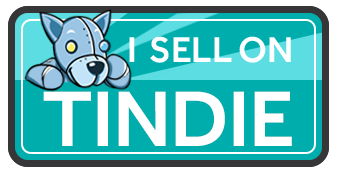 The I2C, and half of the input pins are still available, and SPI could be freed up so there are lots of choices. 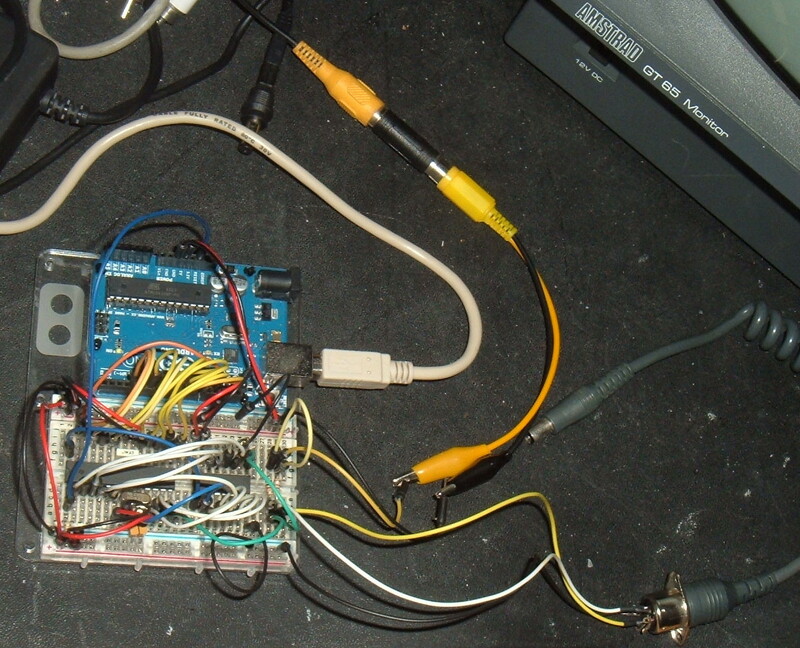 The sync and video are wired to the monitor inputs directly. The the resistors can be removed if the composite video is not required. 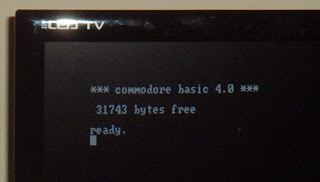 The whole reason for doing all this is to drive a Commodore Pet monitor, as part of my Pet Project.